At Bobcat Ridge, we usually start the morning with whole grains and protein. Granola with home made yogurt or rice milk and fresh raspberries is a fan favorite, and makes for a quick and easy meal before the day's work. Just as easy, but not so quick, is this simple Apple & Cinnamon Granola. At Bobcat Ridge, most of our food is as homemade as possible, so making this particular batch involved grinding my own oat flour, juicing a neighbor’s heirloom apples, harvesting sunflower seeds, and roasting the granola in the sun oven. If you can get your hands on a giant sunflower at your local farmers’ market, I encourage you to do so. But be warned, you WILL lose a few nerve endings in your index fingers and thumbs while hulling the seeds. I can’t even begin to tell you how much time I’ve spent squeezing those tiny suckers out of their shells. It’s addicting! My only recommendation – download the latest volume of This American Life podcasts and get busy. If you A. don’t have that kinda time or B. would like to keep your nerves in tact, store bought sunflower seeds will be just fine. For those of you with lengthy attention spans and/or masochistic tendencies, lay the fresh seeds out flat on a baking sheet and crack them with a rolling pin to kick start the hulling process. But you didn’t come here to learn about sunflower seeds, did you? It was probably the apples and cinnamon bit that caught your attention. Or maybe you just adore my seamless integration of storytelling, recipes, and photography. Oh stop, now you’re making me blush. Anyway, less about me, more about apples and cinnamon. These two are a match made in heaven. My first memory of this dynamic duo lies in a little brown packet of Quaker microwavable oats. Well, there’s no microwave on this farm and the only Quakers are the neighbors, but this granola is better off without nostalgia anyway. This is especially true since I never much liked granola in the first place. It was always too nutty or too crunchy or too, you know, not sugar cereal-y. But after my recent trip to Napa where I sampled my cousin Deborah’s Local Eden granola, my taste buds were rocked. Upon discovering that my hosts at Bobcat Ridge were granola pros too, I’ve pretty much done a 180 as far as granola-related judgments are concerned. So here you have it, a delicious and simple granola recipe that, in the wise words of a golden haired antihero, is “juuuuust right.” The oat flour helps bind clumps of oats together and the apple juice sweetens things up. You can go light or heavy on the seeds and nuts, just as long as you don’t forget the cinnamon. Measure 14 cups of rolled oats into a large mixing bowl. Add flour and toss to coat the oats. Add pecans, chia seeds, and sesame seeds. Combine liquid ingredients in a large measuring cup or small mixing bowl. 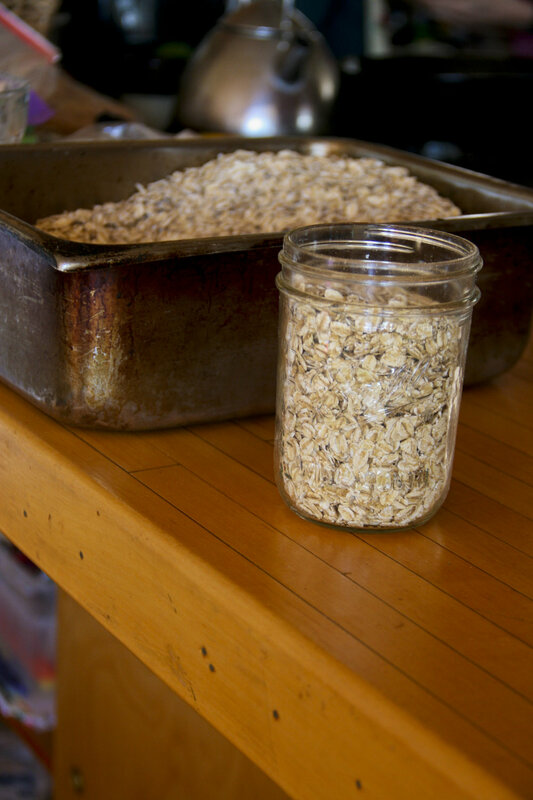 Pour into dry mixture and use your hands to evenly coat oats, nuts, and seeds. Spread granola mixture onto two large baking sheets. Bake until crispy, approximately two hours. Rearrange granola occasionally to bake evenly. Store in large jars or gallon-sized Ziploc baggies.